Dana Pride, performing modifications on HIAD test setup. Photo by Adam Küykendall. Being an engineer of any kind is not an easy task, and sometimes incoming students need extra motivation to take up such a difficult and important major. Dana Pride serves as a mentor to potential engineering students in her time away from the Advanced Structures and Composites Center, where she works as a Student Research Assistant. Pride is an undergraduate senior majoring in Civil Engineering from Sabattus, Maine. Pride has been working at the UMaine Composites Center since September 2012, the first semester she was working towards her degree in Civil Engineering. 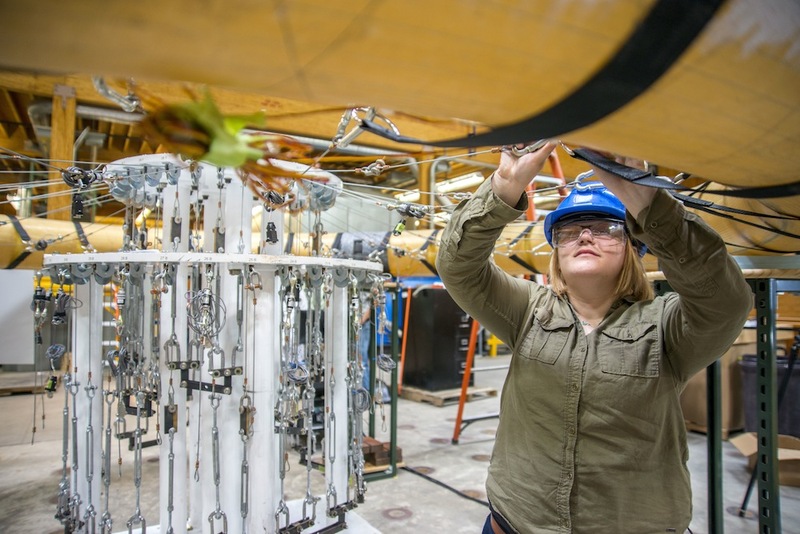 She was originally hired to work on the Secure Hybrid Composite Shipping Container project before moving onto the NASA Hypersonic Inflatable Aerodynamic Decelerator (HIAD) project in the Spring of 2013. Pride specializes in the use of the ARAMIS/PONTOS systems to calibrate, set up, test and process data that is gathered. She also has experience training students on how to use the program, and has become one of the go-to people for teaching the program. “When it comes to other projects using ARAMIS, I help newcomers get started,” Pride said. The ability to learn and teach programs that are vital to product development at the center is one of the skills Pride identified as being the most important. While learning programs and conducting tests on the HIAD program, Pride enjoys the flexibility of being a student researcher at the center. Pride’s supervisor, Josh Clapp, recognizes the skills that Pride picked up at her previous job are related to her work as an engineer, “Dana is a former waitress, which may not seem applicable, but the skills required to do that job have proven to be very beneficial to our engineering research projects. She does a great job of listening to instructions, remembering all the important details, and delivering exactly what is needed in a timely manner. She is very organized and able to multi-task efficiently, which is helpful working in a team environment on multiple projects simultaneously.” Clapp said. In addition, some of the staff members at the center were engineering undergrads at UMaine and know what it is like to balance a research position with a full course load. According to Pride, the element of teamwork has been an extremely positive piece of her overall experience. “Teamwork is important because as an engineer you’re never doing a large task by yourself; you will be consulting with others. Your job is a small part of one big picture. ‘None of us is as smart as all of us,’” Pride said, quoting a UMaine Composites Center motto. The culmination of these skills and experiences came in the form of the 2014 Undergraduate of the Year Award from the center’s Director, Dr. Habib Dagher. “For the past two years I have gone back to my old vocational program that helped guide me into civil engineering, and I talk to the students about UMaine, engineering and the Center too. These students have already expressed interest in engineering, so it is fun to get students excited for their futures,” Pride said. Pride attended the Lewiston Regional Technical Center throughout high school. Pride helps students discover all of the engineering opportunities at UMaine. Looking towards the future, Pride wants to stay in Maine and work as a Civil Engineer.